Having watched our three children graduate, I have experienced firsthand the angst and joy that comes with parenting teens as they navigate those final high school years. Wanting to keep our own kids entertained and safe on grad night, I embraced the idea of an After-Grad – an all night, safe alcohol free celebration. With over 22 years of event planning experience, it made sense to offer my time and planning expertise to our local high school to help them make the shift to a dry, safe, grad celebration. 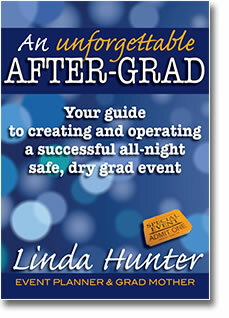 After 5 years of very successful After-Grads, I produced a guidebook in the fall of 2010 – An Unforgettable After-Grad. An Unforgettable After-Grad is an easy-to-understand and easy-to-use guidebook for volunteer committees – a practical guide that provides a step-by-step, month-by-month approach, breaking down the almost year long process into a straightforward, uncomplicated, and manageable project.